I wanted to insert some bookmarks in a book to give away as a gift. Rummaged through my stash and chose a few. But an incomplete bookmark caught my eye. Remember I had promised a pattern back in 2014 at the end of the magic square deconstruction? but I couldn’t quite get the next row to work. You can see my woeful attempts along the left side before I had set it aside. Slow forward to 2018 - This time when I laid it on paper, I could easily create a satisfactory design (sketched on the right side). The recipient loves yellow. I Had to use it. Combo of Lizbeth Falling Leaves & Anchor yellow both in size 40. This combination looks even better in real. The 2 rows were worked separately since I wasn’t sure what size ring was needed. But if the same colour placement is followed, we can throw rings off row 1 chains using 2nd shuttle. Then the outer row will be mostly chains all around. It can be worked continuously if we climb out with a split chain. 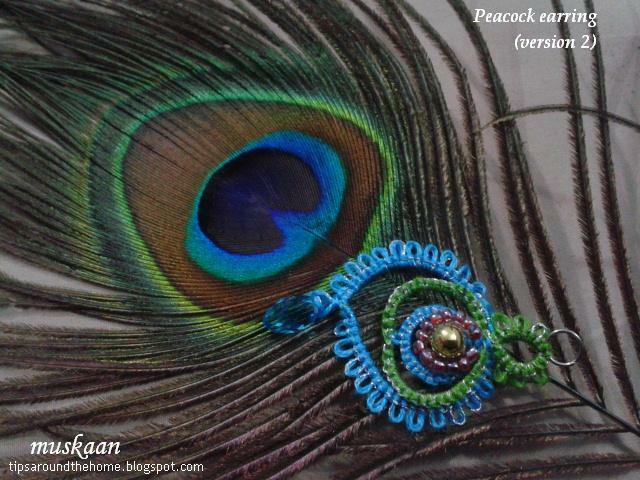 With requisite beads, it can make a lovely bracelet or choker or perhaps adorn a headband. The book is "Einstein. In his own words" by Anne Rooney. It is a fairly good collection of his thoughts and ideas on varied subjects, with some rare images thrown in. A hardbound copy, good print, and one can pick up reading & leave off anywhere. This forms 1 motif. Repeat for length required. To turn corner, omit the 5ds chain. Instead make chain: 6 – 6 – 6. Then turn back, joining the rings as you go. First ring will be joined to R2, and next ring will be joined to both the previous ring and R1. Attach threads to one of the side picots. Ch: 10 lock join to same place as ring, 8 lj , rw. Continue with ring as before. Turn other corner in same manner. Add decorative picots if desired. Do you think it should have a tail? If yes, any suggestions? Peacock is the national bird of India and today we are celebrating the adoption of our Constitution in 1950. Seemed like a good day to share the pattern inspired by peacocks – one of my favourite birds. There are reasons for choosing certain techniques and effects, most of which I have already explained in that post. I have detailed my own working in the pdf. However, it is left to the tatter’s own preference to work the pattern as s/he sees fit. I have deliberately not tried to work it in one colour, though. I found it Extremely difficult to take a photograph of the blue/green model alone without having something else beside it. It always turned out hazy. Below is the only pic that survived the dump. 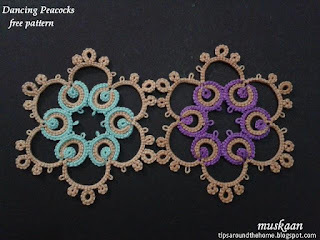 I find that if picots are added to the thrown rings, we can join medallions for a longer lace. Placed side by side, this is how they would look. 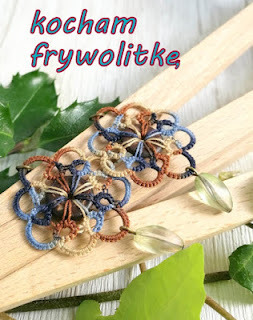 The previous post contains some more details and pics of the earring adaptations. And in the process I figured out another Inkscape hack on how to quickly draw an over-under thread - as a continuous curved line undulating around a previous element. Hope I have time to make a proper post. Lots of links are included in the pdf. Click on the blue text to go to the source. 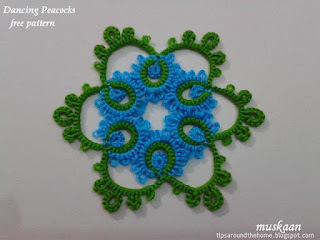 There are also suggestions for some variations and adaptations of the pattern. Republic Day is also celebrated by flying kites. The late afternoon/evening sky is filled with colourful kites! I don’t know how to string and fly a kite, but I can sure string and let my shuttle fly!!! Pozdrawiam ciepło (I greet warmly). 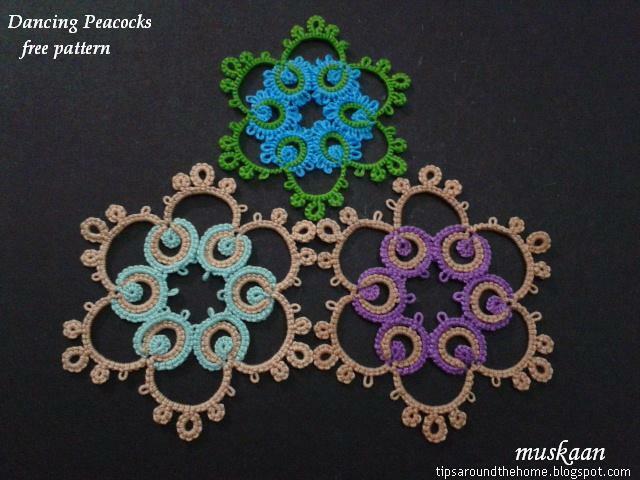 This month’s task for “I Love Tatting” is titled “Goose Circle” – isn’t that cute! Justyna listed some tutorials and examples of bead(s) within rings and also alternate forms of beading. 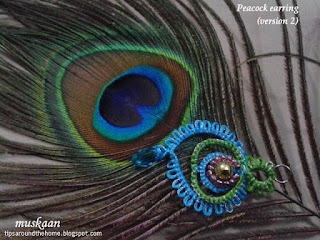 I’ve already used the bead in SR and in SCMR in a few of my own patterns & other projects. Since “floating beads” was also a listed option, I chose to float along :-). 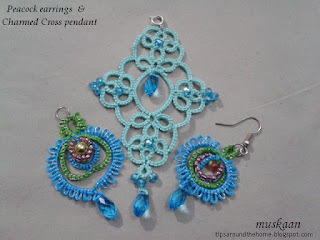 I used the floating bead (FB) method to add both teardrops in the Charmed Cross pendant – yes, this is the final version. I’ve added more crystal beads and the horizontal arms don’t look like stumps any more. But more on that when I share the pattern. 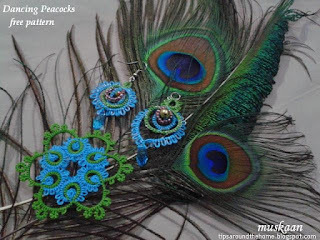 There are 2 versions of the Peacock earrings. 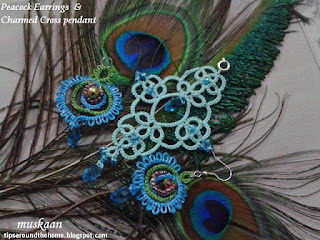 These are derived from this dancing peacock medallion. Worked with 2 shuttles, 2 colours. Anchor embroidery threads are used : 3 strands of each colour woven with 1 strand of silver. 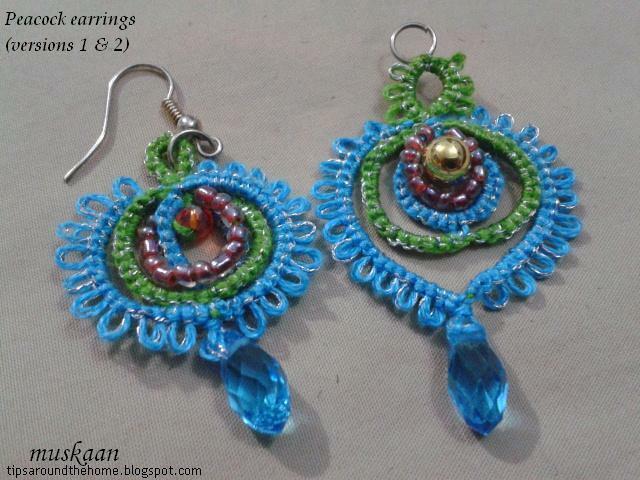 The bead in the center and the teardrops were added when required, using floating beads method. Seed beads are pre-strung for the overlying string. 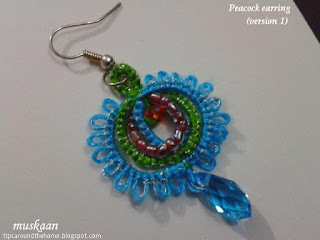 For outermost round, one can use seed beads instead of picots, but I didn’t have any in suitable size/colour. In version 2, I tried a little heart shape in the green, and a slightly tipped point in the blue. but I didn’t have any in suitable size/colour. I used a shoelace trick (SLT) to lock it in place. This also created the sharper tip. Start with topmost ring, attaching the findings. Add large bead (red crystal or gold) using floating beads method (or pre-strung). 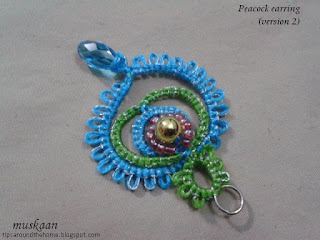 Work innermost ring in blue around the bead, with picot small midways. 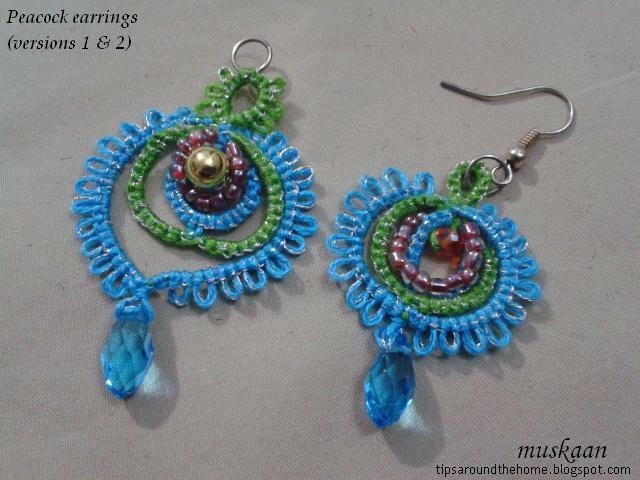 Bring forth the seed beads and create a layer around blue ring. Lock join to base of ring. Switch shuttles and work green chain. Join to blue ring. In version 1, add a small picot for linking next round; in version 2, make chain longer and lock join to blue ring. Over and under or Alligator join across base of rings, switch shuttles, and work the outermost round in blue with decorative picots. In version 1, join to green ring then add FB teardrop midways. In version 2, make chain longer, SLT, add FB teardrop, continue around. Tie and cut; hide ends. Beads give us the opportunity to add more colours without having to use extra shuttles! 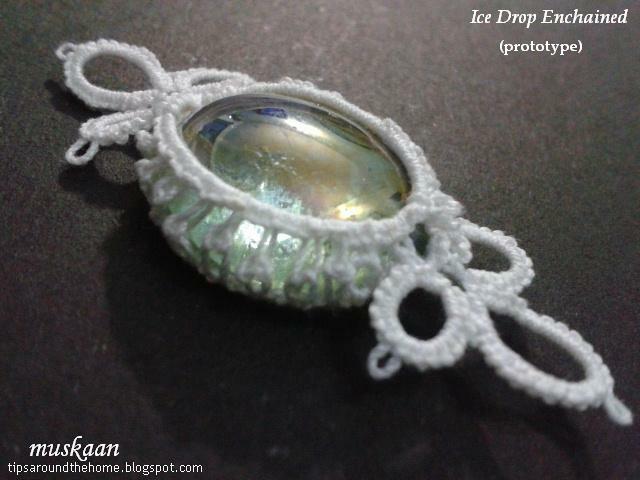 One can pre-string the teardrop (or sew it on later) instead of floating bead method. But I like how the FB makes the bead dangle a little further from the stitches. Also, since I use Pony shuttles that are too small to load large beads, this is a convenient alternate. I hope you take the time to check out what the other talented participants have created. A few days back I bought assorted glass pebbles in order to make Jane McLellan’s Elana. Didn’t get to it (yet) but I had an idea when I made my charmed cross pendant. 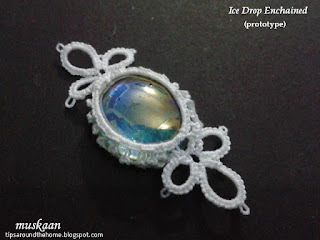 It has a large open space in center – ideal for an ice drop makeover! Finally got around to experimenting with it this morning. The picots turned out to be too short. This is the price I paid for being lazy and not leaving the warm winter sun to get a picot gauge! But I improvised….by using a lock join with shuttle 2 (also called a ball thread join) leaving enough space to create a mock picot when encasing. Just like we do in Inverted Tatting. I must say I’m not unhappy with the textured edge this creates. This is worked in Anchor size 40 and is easily adaptable to any shape and size gem. The stitchcount needs tweaking. I had to substitute the original gem. Worked in one pass, but I let the chains make a single point at the tips instead of having an all-round encasement/pocket. The picots need to be longer still. I ended up keeping the medallion at the back and working the other chain from front. Not that this should be a problem. The fact remains that it Can be done ! A gem caged between chains within picots ! Even normal picots with regular picot joins. Some dexterity is required to hold the piece when joining, though. I held it sideways, ie., the side faced me, thus making it easy to pull loop through picot and make joins. 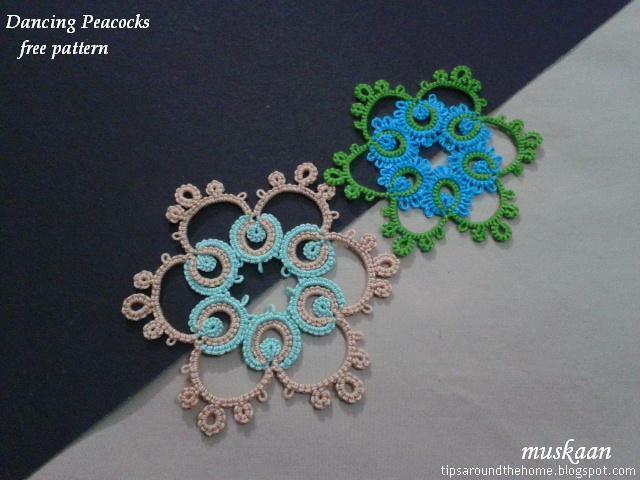 Tat the clovers on both sides – front and back – and join while tatting, inserting a large bead/gem within the space. 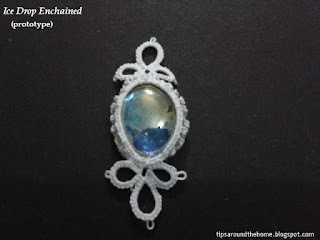 This would create a nice pendant when chains were inserted at both ends later. For some other day…. Another idea based off Diane’s recent ice drop – tat a twin split ring braid, folding it along the middle to encapsulate the gem. Then add any more rounds as desired. A long time back I had started reading the Bible and finished the Old Testament. Then my eyes gave out and I haven’t returned to it since. But one of my dear tatting friend recently suggested I read the gospel of Luke if not the rest. I have yet to do it, but this is a reminder. This is the tweaked charmed cross pattern to look more like a cross. A floating ring on either end extends the horizontal bar, while additional rings and chains add length vertically. Can’t say I’m happy – perhaps changing the chain direction to face inwards at some places would make it a bit better. But that is for some future day. Worked in Lizbeth size 40. I now regret having bought only variegated and no solid colour in Lizbeth. For some reason I didn’t enjoy working with this at all. And as you can see, by the second round I couldn’t be bothered to try to hide colour blips caused by the lock join. Also, I didn’t snug the chain stitches properly on the right side thus getting an asymmetrical outline inside. There was also plenty of retrotatting to do. All in all not a happy experience. The saving grace was the lock chain tails. I’ve long admired and wanted to do those little charms along a tail and this seemed like a good project to use in. And in order to balance the width of the cross with the slim tail, I worked a 2nd tail. Can’t have enough of bookmark tails - read my argument for multiple tails here ! 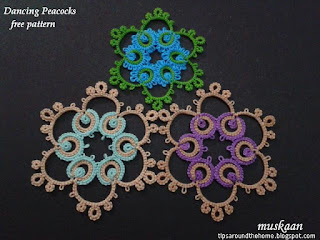 What truly charmed me was Denise’s enthusiastic testing and working of the charmed cross pattern. She made little tweaks to suit her taste. Notice the charms? And the Heart-shaped glass gem in the center?! These are all meant as gifts for her church friends. She tells me that since it will be close to Valentine’s when these will be gifted, she used the heart and I guess the lovely pink shade. And for the record, I now have a finalized version of the charmed cross pendant to share soon. am I going mad over medallions ? do you find it maddening to go through it with me ? Yup, more trials, prototypes and procedural peeks ! Made sporadically over the last several weeks, experimenting with different elements and effects to form enclosed space medallions. Combination of elements -- space outlined with alternating split rings and chains. I’d forgotten all about this. Lucky to have taped it on the page! Trials start from bottom up and the yellow one is rejected now. 2nd round creates a bit of a swirl wave if seen closely. Need to decrease the negative space. I had some time today and worked around the square with small tweak. This one has offset picots and smaller SRs in 1st round. 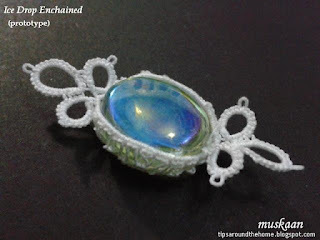 Techniques : 2-shuttle tatting, split rings, lock joins. 2 rounds. About 3.5" in Anchor size 20. Onion rings enclose the space. This design gave me grief!!! Whether it was getting the innermost JR to lie flat or where to place the picot to join adjacent rings. 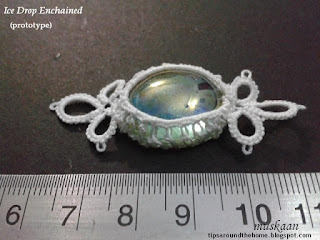 Also, how many onin rings were needed for the medallion to lie flat, since I didn't want to increase the length of the connecting chains. The bits you see above don't show the parts where I un-tatted and re-tatted! Finally, I did away with joining picots altogether. Now, I can decide where the adjacent rings need to be attached and place picots accordingly. The innermost ring is a FB-JR. The overhand knot in floating beads method Does make the Josephine Ring lie in same plane as the outer rings. Although I deliberately made spaced out concentric rings, it cramps the adjacent rings. Need to reduce the stitchcount in the 3rd onion ring. Techniques : 2 shuttle-tatting, Josephine ring using Floating Beads method, Onion rings (faux rings made with chains), dots, thrown/floating rings. Celtic or Interlaced center made with lock chains. This piece is made in pieces ! Hence the name. Although there are many on my to-tat list, I don't remember tatting any such faux-Celtic pieces. So I'm actually thrilled to get something off the shuttles! 2 triangles make up the 6-point interlaced center. Then a round of lock chains. Next a 6-tip insertion through rings. Followed by another round of LCh. Need to remove the last round (as already done above) unless more rounds are added. Need to increase the central negative space, and also use different colours. Lots of tweaking required ! 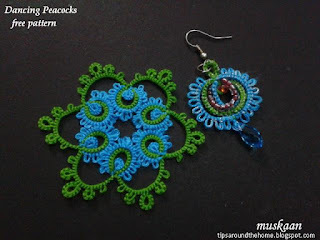 Techniques : 2-shuttle tatting, lock chains, interlacing, lock joins. 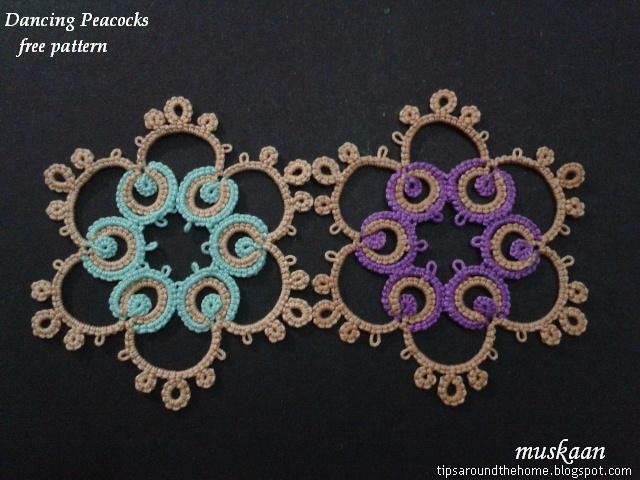 For the present these are standalones, but can easily function as motifs to create larger lace. 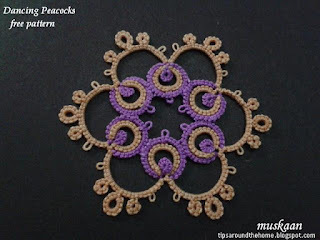 Medallions are a quick, fun way to design and stop whenever desired. Who knows I might come back to enlarge some of these at some future date. Meanwhile my medallion stash increases (as does my workload ;-P) ! 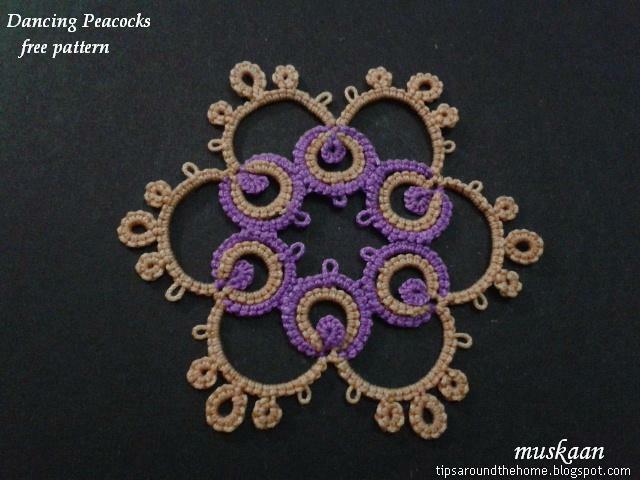 Off and on, for the past few months, I’ve been tatting and designing medallions - different shapes and effects. I’ve already shared some medallion patterns/prototypes. 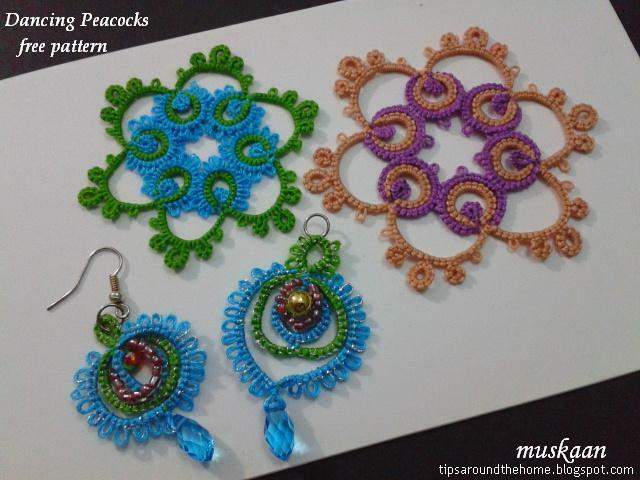 I wanted to create an oval shaped inner space with chains and use trefoils instead of clovers. It is interesting to discover that clovers are more prolific than trefoils for the center. Browsing the net and antique books didn’t turn up anything within those parameters. Or perhaps I didn’t like the ones that did show up. Either way I set about trying my hand at this shape. 1. First came the one in purple with my basic elements – chains and trefoils. 2. Both elements needed bolstering, hence anchored the trefoils to the chains, and linked ring pairs to each side in the next round and . 3. My 3rd attempt was more of a cleaning up. I shifted the ring pair to the inner chains - as thrown rings (hence outward facing). 4. Trying to get out of my comfort zone, I tried to spruce up the 2nd round. While ending, I eliminated the thrown ring at the top to see what it would look like and to give me an option for next trial. This made it look a bit like a cross! 5. Sewed in beads using Anchor size 40 in same colour. In case I didn’t have the same colour, I would’ve followed Jane’s tip here. 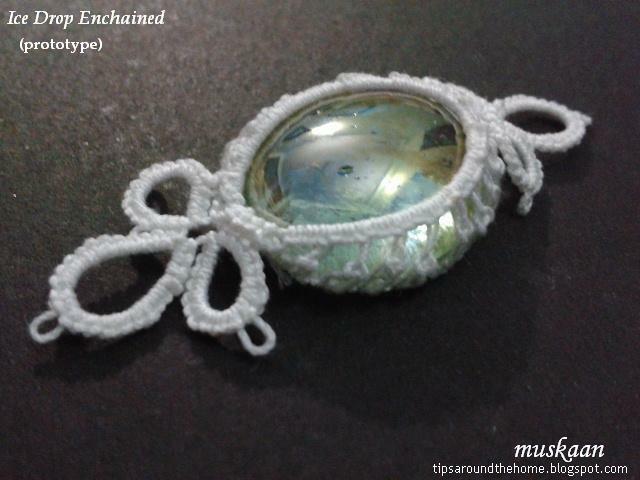 In Anchor size 20 (close to a size 10 Lizbeth), this pendant measures 2”x3”. In smaller thread it can be used for earrings. I call it “Charmed” because one can use a charm of one's choice instead of a teardrop in the negative space. I don’t have any in my stash to show though. It can be tatted in one pass using a split ring on the side pair to climb out, and Floating Beads method to add teardrop beads/charms. The crystals can be loaded on the shuttles. However, was the initial goal accomplished? The medallion is more spindle shaped inside and angular outside, than an oval.